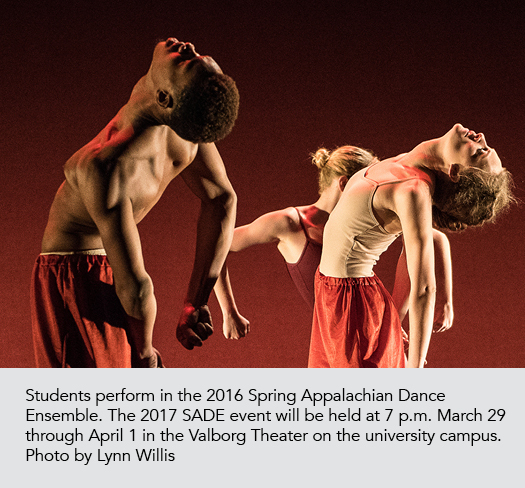 The Department of Theatre and Dance at Appalachian State University will present the 2017 Spring Appalachian Dance Ensemble (SADE) at 7 p.m. March 29–April 1 in the Valborg Theater on the university campus. 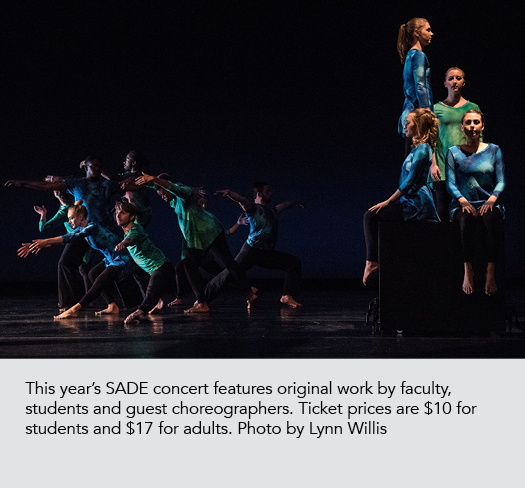 SADE is an opportunity for dance faculty and students to showcase their talents through both choreography and performance. Ticket prices are $10 for students and $17 for adults. 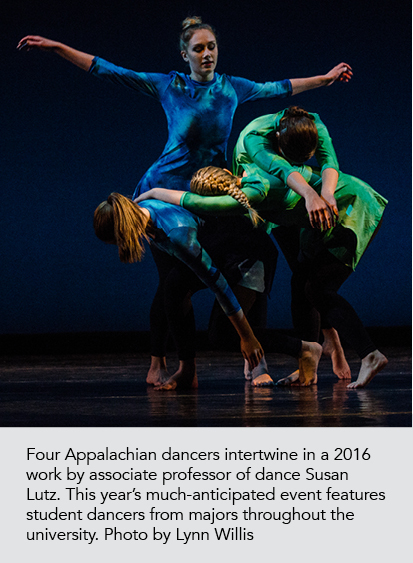 The event features eight original works created by guest choreographers, Appalachian faculty and students. Faculty choreographers include Regina Gulick, senior lecturer of dance studies, and Kevin Warner, chair of the Theatre and Dance Department. Student choreographers are Roberto Bell, a junior dance studies major from High Point; Victoria Buwick, a junior public relations major from Matthews; E.C. Fajardo, a senior dance studies major from Virginia Beach, Virginia; and Bronwyn Weismiller, a junior commercial photography and dance studies double major from Greenville. 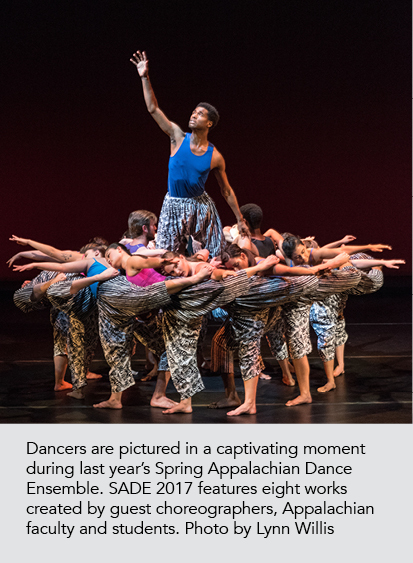 This year, Appalachian will host two guest choreographers, Dante Brown, choreographer and educator at Warehouse Dance in New York City, and Brad Parquette, local dance professional and director of Western Carolina Youth Ballet. 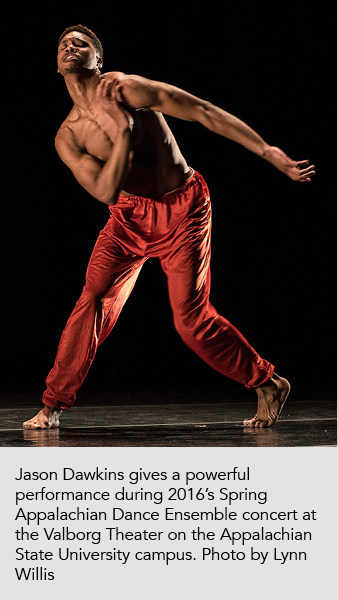 Brown is creating original work with a cast of Appalachian students as part of his week-long dance residency at the university March 5–10. Sherone Price, associate professor of dance studies, serves as the rehearsal director through the run of the show. This much-anticipated event provides involvement opportunities for all majors, encouraging students to engage in dance whether through choreography or performance. For more information, call the Schaefer Center box office toll-free at 800-841-ARTS (2787), contact the Valborg Theater box office at 828-262-3063, or visit the department website at www.theatreanddance.appstate.edu.